Soccer is a dynamic game that challenges an athlete’s physical and tactical abilities. From a metabolic standpoint, athletes must be conditioned to sustain short, intermediate, and long sprints with a high degree of change in direction. Players must utilize accelerative bursts of speed and rapid deceleration. Athletes are required to perform these short bursts repeatedly, which necessitates quick recovery. During the periods of intense bursts, the athlete must be able to physically to possess the ball while holding off the opponent, challenge opponents for possession, and strike the ball from multiple angles and distances. The objectives for developing the soccer athlete demand training towards improving power, power-endurance (stamina), takeoff power, and maximum strength. From these listed objectives, IFA has prioritized three primary performance factors as the main sources of athletic development via implementation of a strength and conditioning program. Direct development of strength, lateral acceleration and deceleration abilities, and anaerobic and aerobic capacities set the foundation for peak soccer performance. Soccer is a contact sport, in which players use their bodies to battle for possession of the ball as well as position on the field. Strength is a paramount factor in contests for possession. Evaluation of low versus high-level soccer players highlights a significant difference in leg strength and the positive correlation with short distance sprint speed. This difference is also highlighted in youth athletes. Implementing a progressive strength and conditioning program has been shown to increase the velocity of the leg when striking a ball. Strength is the ability to overcome or counteract external resistance by muscular effort. The primary mode of increasing muscular force production in IFA programming is the inclusion of multi-joint, barbell-based, open & closed-kinetic-chain resistance movements. These movements include all variations of squatting, deadlifting, pressing, and other movements where athletes are tasked with producing force into the ground while maintaining structural alignment. These movements are the most effective means of developing strength for athletes because they allow an athlete to move the largest amount of weight with their body as the base of support. Closed-kinetic chain movements, specifically, have a higher transfer of training effect to specific sporting movements. Developing strength is a key performance factor within the IFA program, emphasizing the development of total body strength through functional resistance training movements and progressions. The more force an athlete can apply into the ground, the faster they can run, jump, and change direction. Explosive strength is fundamental for a soccer player to obtain the jump height necessary to head the ball or, in other words, the maximal ability of a muscle to exert force or torque at a specific velocity. The ability to win balls in the air has an enormous impact over the course of the game. In addition to goal scoring, players challenge for headers in both offensive and defensive situations. An athlete’s vertical jump in conjunction with their technique and positioning determines their success in heading the ball over the opponent. Vertical jump performance depends not only on lower limb level of strength but also on the rate at which they are able to generate force, on the contraction velocity, on the ability of stretch-shortening cycle utilization, and on the degree of intermuscular and intramuscular coordination. The most effective way to develop force at a high rate is through periodized training programs using both Olympic lifts as well as plyometric training. 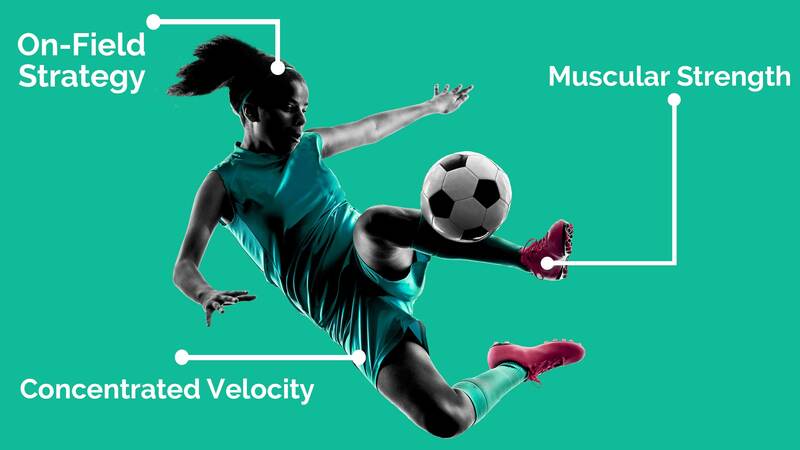 IFA utilizes these science-based principles to provide a training program specifically designed to maximize the soccer athlete’s strength to set a foundation in power and speed based movements. The intermittent nature of the sport places a high demand on change of direction ability. IFA focuses on the development of quicker and more powerful eccentric and concentric contractions, which translate to superior lateral quickness. Athletes can develop elevated levels of lateral quickness or change of direction (COD) ability with progressive training of eccentric and concentric control of single limb movements. This strength allows players to move more efficiently, safer and faster in all planes. A focused long-term strength-training plan has positive correlations with improved COD ability. IFA Soccer progressively trains the development of unilateral control of the lower body, while slowly introducing different loading methods to develop both eccentric and concentric strength of those movement patterns. Developing the proprioceptive properties of proper unilateral knee and hip mechanics helps to increase efficient force production, absorption, and safer joint angles. An athlete who can change directions quickly is able to do so because of their ability to slow the momentum (deceleration) of their body with eccentric loading of the lower-extremity. To improve deceleration, muscles of the lower extremities need to be stressed to eccentrically contract in multiple planes. Deceleration training will overload the body through momentum in all planes, which will lead to improved explosiveness. Single limb training also focuses on the development of proper core muscle activation by stressing the dynamic stability of the athlete. Dynamic stability is stated to be an essential component of change-of-direction ability and multidirectional speed. IFA implements various unilateral progressions that place the lower-extremities through increasingly complex levels of both concentric and eccentric stress. Athletes will comfortably and safely develop the necessary strength for efficient and effective unilateral control for sprint deceleration and COD abilities. In conjunction with strength development, IFA implements a progressive speed, agility, and quickness (SAQ) program. IFA SAQ places a training demand on the ability of an athlete to execute change of direction tasks from simple to complex drills. Movement tasks designed to challenge frontal, lateral, and vertical movement abilities are designed progressively to teach an athlete increasing levels of movement complexity. Training movements with demands on jumping mechanics can help to improve change of direction ability. Using plyometric drills, cone and ladder drills, and other movement challenges, athletes will improve multi-directional quickness and jumping and landing mechanics.